Check the website for information on the Xmas/Holiday party. I just looked at the blog and it has been pretty quiet here. If you are a member or recent member and didn't get a newsletter emailed to you, let me know so I can update your email address. You might have fried an egg on the sidewalk in Austin, but the winds were blowing at Bird Island, June 28-29. We busted out the GPS on Saturday and clocked some great speeds. I was proud of my 17mph. But of course, Andre hit 25-something, and Nguyen hit 27.7mph. We might have to make that a regular thing on the trips. The club trip saw some newer faces on the water, as well as some more familiar ones. Among the folks I saw (sorry if I miss someone): Chris D, Andre A, Nguyen N, Steve H, Jayne W, Cassie B, Celia, Steve, Brian M, and a few other Austin folks. Not to mention Mike, Milo, Shawn, and Jay P also took to the waters. The new folks took advantage of the great lessons at Worldwinds. The rest of us enjoyed the flat water and the 15-25mph winds. Big thanks to Andre for building a big patch of shade--one massive tarp, some poles, and guy wires stood up to the winds and made down time actually cool and comfortable. 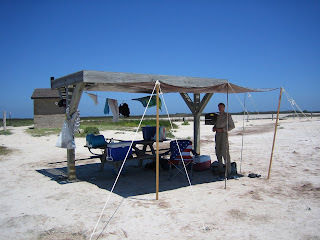 Chris and I bought a Futura 155, so we hope to head back to Corpus before the wind completely dies for the summer. See you next time, and happy sailing! Starting this week, I'd like to invite folks out on Thursday nights after work to participate in either some Stand Up Paddle boarding (SUP) or Sailing. With the lake low, the sandy peninsula at Windy Point has become a popular destination. The lake now seems to be attracting kiters, windsurfers, board boats, SUPr's and beach goers of all shapes and sizes. For the past 10 years, on Thursday nights, one of our clubs most generous benefactors has brought his own personal gear out and allowed people to sail it for free. That individual, Mike Schultz has spent countless hours and thousands of dollars to promote windsurfing in Austin. Now, with the availability of good hybrid vehicles, the state of our environment and the fact that windsurfing is now back and back with a vengeance (here in Austin), Mike will no longer be towing his trailer out to the point (his new hybrid is not capable of towing a trailer). In keeping with his style, Mike has offered to donate his trailer to the club. Mike, on behalf of the club, thank you for your generous donation and tireless efforts to promote windsurfing here in Austin! 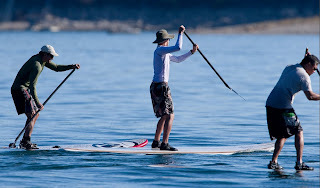 I propose, for the new Thursday night program that we come out and either sail or Stand Up Paddle on our own gear. People will see us, they will ask questions and we can answer those questions. Many of the questions will be answered with, "Yes, we have some of the best conditions in the world here in Texas! Learning to windsurf has never been as easy as it is today. Our next Learn to Windsurf clinic is ...... Additionally, you could drive down to Corpus and visit www.worldwinds.net which will set you on a path you will never forget." In some cases, the conditions might be appropriate for giving a lesson. In those cases, if you're out riding one of your durable and floaty boards with a smaller sail, it might make sense to provide a lesson. If former clinic participants turn up, it might be nice to let them take a turn on the gear you have on hand (if its appropriate for such use). Finally, as good deals become available on craigslist.org or when people donate gear to the club, we might try to refurbish it, create a complete set and give it away to interested sailors on Thursday nights. We might even have a timed race around the buoys on the gear we've refurbished to determine who gets to take the gear home. The first 2009 Learn to Windsurf Clinic went off with a bang (literally) as inclement weather caused us to postpone our planned Saturday, May 16, 2009 date in favor of Sunday, May 17, 2009. Despite the change in date, everyone I spoke with had a positive experience and we introduced more than 10 new windsurfers to the Austin windsurfing scene. Former AWC President Ron Hensley demonstrates how to turn downwind on the land simulator on Sunday, May 17, 2009. Below, Marlene greets new students with a smile and displays more information about our Charity (the Spastic Paraplegia Foundation). The next Learn to Windsurf Clinic is planned for Saturday, June 20, 2009. As of today, all slots have filled and it looks like we are headed for another great clinic! Thanks to all who helped out with the last event! The 2009 Racing season started with the AWC Race Committee (Tim Marvin, Guy Miller, Darran Rolls, Brian Shepherd(me)) attending 2 separate Regattas. Tim Marvin and I decided to join new Formula Racers Nguyen Ngo and Chris Martin at the "Deniz Tor" Regatta in Corpus Christi Bay for what was planned to be a one day event on Saturday 3/7/2009. The other half of the 2009 AWC Race Committee decided to honor our original commitment and drive the 20 hours to Merritt Island Florida for the 24th annual Calema MidWinters. As it turned out, the forecast for Calema had been light all week while the forecast for Corpus looked beyond awesome! Darran and Guy left Wednesday around noon for the 20 hour drive to Florida. The Corpus group decided to drive down on Friday afternoon and start the festivities in CC Bay. Chris Martin and his girlfriend Ember left Austin a bit earlier than Tim, Nguyen and myself so they arrived a few minutes ahead of us and discovered a group of locals sailing at Oleander Point. As it turned out, one of the locals was Chip Ducrest the Commodore of the CCWA and primary organizer on the windsurfing side of things for the Deniz Tor Regatta. He welcomed us to CC Bay and told us about the forecast for Saturday which was looking very windy! As it was blowing a solid 20-25 knots each of us pulled out our short boards and small sails and blasted around at Oleander on gear we don't get to use that much at Lake Travis. At the end of the day, everyone was smiling as we'd all had excellent rides in excellent conditions on gear we use infrequently. After a few beers and some jawboning, Chris and Ember headed off to a hotel they had reserved in advance and couldn't cancel, while Tim, Nguyen and myself loaded up and headed out to Bird Island to camp for the night. While camping out at Bird we happened to camp next to 22 year old Wisconsin native "Captain Keith". Keith is quite a character, and over a few beers, chorizos and tortillas we learned that he was seasonally unemployed and had been living out of his suburban at Bird since mid November! Apparently Keith had only successfully executed 4 gybes in his life prior to his trip to Bird. As of the weekend of March 7th, he has now executed 2 flat water loops and probably countless gybes of many variations!! This is a tribute to Keith's persistence and skill as well as the awesome conditions we have down in Corpus. After a few more beers, I discovered Keith was missing a board in the 95-105L range so I gave him my F2 Sputnik. He responded in kind and gave me a 125L Tiga! I was pretty stoked with the board as I always seem to be riding something either too big or too small and 125L seems like a perfect size for me. The night ended late but we got up early cooked a big breakfast (with strong coffee) and headed down to CC Bay Yacht Club for the Skippers meeting. At the Skippers meeting we met up with the rest of the locals, the Race Director (Doug) and Jon Jay Ernst (2008 US Open Champion). We all listened to Doug brief the group of boat sailors (just 2 boats competing) and agreed on some basic race parameters. As we shagged off to McGhee Beach to rig up at around 9:30AM, the wind was probably blowing in the 15-20 knot range and holding pretty steady. It was beginning to look like the 30-40 mph forecasts we'd been hearing about might not happen (but this is Corpus and we all know what happens when the sun comes out!). By 10 AM the wind had started to escalate and sand begin blowing up off the beach and into our faces/gear. I decided to carry my gear to the waters edge and rig up on the wet sand where at least I could avoid the sand blasting. I also thought the longer I took to rig the better off I'd be as I could make some last minute downhaul/outhaul adjustments with the real race conditions in mind. By the time I hit the water with my 9.5m MS-2 and SB162 the wind had escalated into the mid-high 20's with gusts in the low 30's. I couldn't keep my board on the water and felt pretty certain I was about to destroy my mostly new SB162. Fortunately, I made it back to the beach with not one ding! One by one, all the eager racers who sailed out to the start boat ahead of me came back to the beach (in various stages of control). Jon Jay wisely stayed put on the beach with his 10m TR-4 as the wind jacked up into the 30's. Once everyone was back we quickly realized that everyone wasn't back! Chris Martin was missing! Chris had purchased a 6.6m Hucker from a CC local and had rigged it on his Chinook Formula boom. We were starting to get concerned when we got word from the committee boat that Chris was not only doing fine but was actually out racing in the 30+ conditions against the boats!! Tim and I certainly felt a bit embarrassed as this new Formula Racer had just shown us up in some pretty heavy conditions! So, Tim and I rigged smaller sails and sailed out to the Committee Boat to join Chris for Race #2. When we arrived we discovered Chris sitting on the committee boat drinking a beer with his board tied off to the back of the Committee Boat. He looked to be having a pretty good time! Awesome job Chris! Tim and I started race #2 and we took off upwind towards a mark that was supposed to be "upwind" but was nowhere close to visible. At some point, Tim and I separated and I ended up out in the middle of the bay by an oil derrick. Looking around was difficult as I needed to keep focused on the sea conditions to avoid crashing violently. I eventually decided that looking around for a buoy in 3-6 ft seas was pretty silly and I decided to head back downwind to the Committee Boat which was now out of my field of view as well. The downwind run went quickly and with the swell rolling beneath me it was an amazing experience that equals the best times I've ever had windsurfing! Upon my return to the start line/Committee Boat, Race Director Doug yelled "Where's your Buddy?". My downwind stoke dwindled instantly and I tried to slow down and scan the horizon for Tim's sail. Within a few seconds of taking my focus off the seas around me, a big wave rolled me and I wound up in the water. It was abundantly clear that trying to find someone in these conditions would be very difficult. I decided to head upwind and look around a bit in the last area where I'd seen Tim. There was no sign of him and I hoped that he'd headed back to the beach after leaving the Committee Boats view. I headed back to the beach and told the Committee Boat I was going in. Upon my arrival I discovered that Tim had been spotted and everyone was accounted for. Tim actually found the upwind mark and completed the course successfully! Collectively, we managed to make it off the Bay without breaking anything expensive or sustaining any serious injuries. After a quick feasts of bean/beef Nachos, Guacamole and a few beers at the Yacht Club we made arrangements to race again on Sunday. After lunch, and a bit of recuperation time, everybody was ready to do some more sailing but this time on flat water with our small boards. We headed back to Bird and blasted around for another 2-3 hours with the Bird Island posse until the sun and wind finally begin to drop. While we were having some awesome life experiences in the Bay, Darran and Guy were sitting on the beach in Florida with conditions that were even lighter than what was forecast (and the forecast was light to start with)! By Saturday, the Formula fleet in Florida hadn't managed to get even one race off. Darran had a plan and he executed it flawlessly. It involved driving overnight in shifts and stopping in Corpus to race with us in CC Bay on Sunday! By Sunday morning Guy and Darran had made it back to Corpus and were having breakfast at a diner as we were driving back from Bird to McGhee Beach for a second day of racing. The winds were lighter but good on Sunday and we managed to have 4 reasonably competitive races in 10-20 knot conditions. Guy won all 4 races on Sunday and took first place overall. Tim did well on Sunday and his first place finish on Saturday vaulted him into second place. Chris Martin, with his first place finish on Saturday and a good showing on Sunday came in 3rd. While we all had a great time in Corpus, this race is significant for a variety of reasons. For starters, we made a good impression on the CC locals as we arrived in greater numbers than they probably anticipated. Also, our commitment to local racing could not have been clearer as Darran and Guy drove all night to race with us and then performed very well. Next, we introduced Nguyen and Chris to CC Bay which is the 3rd rated venue in North America and a challenging place to sail. It was clear that they were both stoked by the experience and I'm hoping more Austin locals come check out CC Bay next time! Finally, it signifies that racing in CC Bay is still alive and enjoyed by many. Speaking on behalf of the 2009 AWC Race Comittee - we look forward to more events in CC Bay and look forward to wider involvement between our club and the CCWA. On Saturday, December 13th, Ex-AWC-Presidents Ron Hensley, Tim Marvin (VP) and Brian Shepherd (me) headed out to Lake Buchanan for some early winter blasting with Steve Madere (a Lake Buchanan/Gorge Bump & Jump aficionado). Terrific venue and an excellent change of pace within a reasonable drive from Austin. Long fetch provides nice big well spaced rollers. Water seemed a few degrees colder than Travis, but the ice storm we had the other day might be a factor in relative water temp differences. Guess we need real data comparative on avg water temps throughout the year before drawing conclusions... Suggest booties: With water level way down, the shoreline is very similar to the lower island area of Travis with coarse sand and crushed granite and also noticed some broken glass bottles (same as Travis). Only $3 entry fee per person with envelope (no attendant). Note: your Windy Point sticker does not work there... BTW, there is a free county park next to Black Rock Park with what looks to be excellent access which would be very handy if you got to the park without appropriate change to pay the fee. Wind was very "up and down," but didn't seem to have the "fists of wind, gusts within gusts" typical of similar Travis days. Was that just wind of the day or venue related? Wind was cross shore. Not certain, but 2-3:30pm sailing time, I perceive the extremes were 5-35mph and most of the time it was solidly 15-25mph. At 210lbs, I rigged 5.7m with 116 liter board. Pretty sure a more ideal configuration would have been 20 liters less board and 1/2 meter less sail. Had much difficulty keeping the board on the water during the 25-30mph periods, but had some nice jumps and some rather exciting speed runs. All-in-all a fun experience made better by the collective of Tim/Brian/Steve. Would enjoy repeating. John Bright was taken from us on October 21st, 2008. In the memory and spirit of one of the most dedicated, persistent and fun loving racers on the circuit, we (the AWC Race Committee) awarded the John Bright Memorial Trophy to the single sailor that best embodies the spirit of windsurfing during our 2008 season. 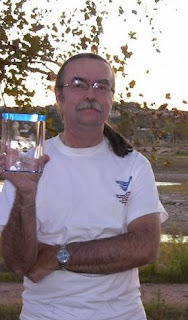 At The 2008 Lake Travis Invitational, in front of racers from across the state, Mike Schultz was awarded the John Bright Memorial Trophy. Congratulations Mike! Mike was an easy choice. In 2008, Mike took part in training approximately 120 new windsurfers at Windy Point. He also generously hauled out his own gear every Thursday from May to September for others to ride (and has done so for almost a decade!). Mike is truly an inspiration to windsurfers everywhere, and his generosity won't soon be forgotten. 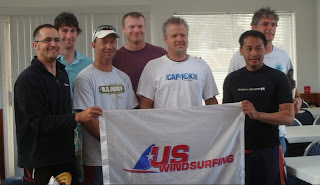 Cheers Mike, and thanks again for all that you have done to promote windsurfing in Texas!